Box Text: Transcend time. Sever fate. The curtain rises now. Dragons have descended upon earth and humanity is at their mercy. 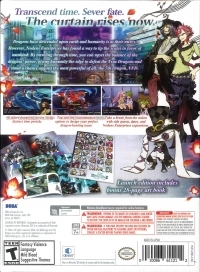 However, Nodens Enterprises has found a way to tip the scales in favor of mankind: By traveling through time, you can upset the balance of the dragons' power, giving humanity the edge to defeat the True Dragons and stand a chance against the most powerful of all: the 7th Dragon, VFD. Explore dungeons across 3 distinct time periods. Tap into the customization options to design your perfect dragon-hunting team. Take a break from the action with side quests, dates, and Nodens Enterprises expansions. 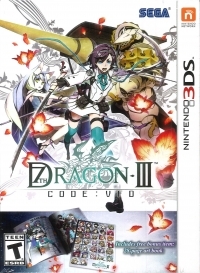 This is a list of VGCollect users who have 7th Dragon III Code: VFD - Launch Edition in their Collection. This is a list of VGCollect users who have 7th Dragon III Code: VFD - Launch Edition in their Sell List. This is a list of VGCollect users who have 7th Dragon III Code: VFD - Launch Edition in their Wish List.